The son of Stoll cameraman D.P. 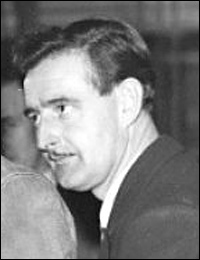 Cooper , Wilkie Cooper made his own name as a cinematographer during the early 1940s at Ealing Studios , where (alongside Ealing's other regular cameraman Ernest Palmer) he was responsible for photographing many of the morale boosting war subjects which were the studio's speciality at that time. Films like The Big Blockade and The Foreman Went to France , both directed by Charles Frend in 1942, are shot in a characteristically unobtrusive and naturalistic style. More interesting photographically is Cavalcanti 's Went the Day Well? (1943), the story of an invasion of a rural village by a squad of German paratroopers disguised as Royal Engineers. For much of the film the style is familiar, but Cooper injects an expressionist feel at times to underscore the plot's darker moments. For example, when the fifth columnist played by Leslie Banks is shot by the rather timid vicar's daughter who loves him, the horror of the moment is underscored by low-key lighting, the cross-cutting between high and low angles and the brief use of slow motion as he falls dead. Cooper subsequently became associated with the filmmaking team of Frank Launder and Sidney Gilliat , how were part of the elite band of 'Independent Producers' working under the Rank umbrella. He shot several of their films, including The Rake's Progess (d. Gilliat, 1945), I See a Dark Stranger (d. Launder, 1945), Green for Danger (d. Gilliat, 1946), Captain Boycott (d. Launder, 1947) and London Belongs to Me (d. Gilliat, 1948), although compared to the work of the other Independent Producers like Powell and Pressburger and David Lean , the photographic stule of these tends to be rather restrained. Cooper's other assignments during this period include the moody thriller Mine Own Executioner (d. Anthony Kimmins, 1947) and Alfred Hitchcock 's somewhat substandard Stage Fright (1950). Cooper continued to be prolific but found himself increasingly restricted to run of the mill subjects, including modest special effects films like The 7th Voyage of Sinbad (US, 1958), Mysterious Island (d. Cy Endfield, 1962), Jason and the Argonauts (d. Don Chaffey, 1963) and One Million Years B.C. (d. Chaffey, 1966), before his career ran out of steam in the early 1970s. This entry is taken from Duncan Petrie's The British Cinematographer (BFI, 1996). Used by permission.